This is the story of Suya. Suya is an African grilled appetizer believed to have originated with the Hausa (Haoussa) people in northern Nigeria and Niger. It is also well-known in Ghana as chichinga or better still, tsitsinga. 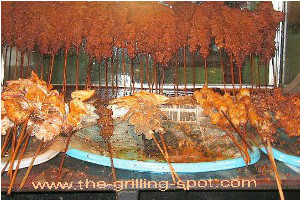 Suya is a very popular spicy snack and meal among the locals in communities of this area and can be made into roasted skewered shish-kebabs. It is made with your choice of meat and a peanut-spice rub called tankora or a peanut powder extract called kuli-kuli. In Africa, peanuts are also known as groundnuts. Suya restaurants normally serve this specialty with a further serving of tankora powder, sliced onions, tomatoes, cucumber and cabbage. Behind every Suya Restaurant is - you guessed it, a Suya Master who commands all the bragging rights for these sumptuous eats. In a casual setting, its popularly served with palm wine - a tasty alcoholic beverage made from the sap of a palm tree. Locally, palm wine is also known as emu or oguro. This name varies depending on the 'strength' of the drink and from one community to the next. Palm wine is best served well-chilled. You can find restaurants that serve Suya in select cities in different parts of the world. Here is a skewered version of this delectable appetizer. Get your skewers on the ready, fun-time is here! The basic flavor ingredients for this appetizer are roasted ground peanuts, pepper and salt, but it can be more elaborate than that, incorporating other kitchen staples like paprika, ginger, garlic and onion powder. Always take note of amounts of 'hot' spices used in relation to food quantity to know the right spice 'heat' for flavoring. On one side, you will need to prepare bite-size pieces of meat. 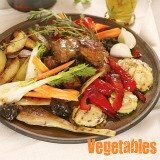 You can use beef, boneless chicken, fish-filet, veal or goat meat also known as mutton. On the vegetable side, you will need to thoroughly wash and cut bite-size pieces of tomato, onions and green pepper. Put your choice of cut meat and vegetables in separate bowls ready for skewering. enhancer with a rich melange of spices. 1) You can substitute the Roasted Peanuts with finely ground or roasted peanut powder. 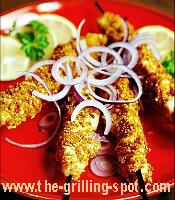 2) Substitute the Cayenne Pepper with Red Chili-pepper or red pepper flakes. 3) Try shopping your local International Market or 'Halal Store' for Maggi Seasoning by Nestlé. Remember too that your recipe will turn out just fine if the Maggi Seasoning eludes you. 1. Take approximately 1 cup of roasted peanuts. Remove all the shells and husks. If the peanuts are not roasted the resulting flavor will be a deviation from the real Suya. 2. Add the peanuts to a mortar and pound with a pestle into a fine powder. You can use a spicemill or a food processor too. Stop grinding just before the peanuts turn into a paste. It happens if you grind the nuts for too long. If it becomes 'pasty' do not dispose of it. Just apply the pasty peanut-spice onto the meat. Pasty peanut-spice is a slight variation from the powder. Explore the variation. A more liquid but thick version of the same peanut-spice is also made for a good old-fashioned marinade. 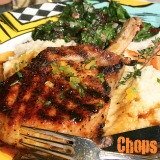 Grillspot Tip! - If you want drier powder, try to remove the oil from the paste by putting it in cheesecloth or a wad of paper towels then place between two cutting boards and pound or stomp. To remove more oil, consider using a shallow baking dish to bake the paste, flat on parchment paper in the oven. Pre-heat the oven to 300 °F (150 °C) and bake for 5-10 minutes. Do not burn the paste. 3. Measure out 3 teaspoonfuls of the peanut powder from the mortar or processor into a mixing bowl. 4. Add the following spices to the peanut powder already in the mixing bowl - 1 teaspoonful each of cayenne pepper, paprika spice, salt and ½ a teaspoonful each of the following spices - ground ginger, garlic and onion powder to make the peanut-spice. Mix it well. 5. Now, divide this peanut-spice mix into four parts. One part will be served with the cooked Suya or shish-kebabs. Safety Tip! - Avoid cross-contamination, by quickly putting away the one-part peanut-spice to be used on the dinner table when serving the grilled appetizer. 1. Use the second part of the peanut-spice when grilling to further flavor up your skewered shish-kebab meat and vegetables as you grill over the hot coals or gas. 2. Use the third and fourth parts of the peanut-spice combined to dip, rub and thoroughly coat your cut pieces of meat to flavor them. 3. Cover the meat and refrigerate to marinate in the peanut-spice rub for at least 30 minutes to an hour as you get the grill started. 4. 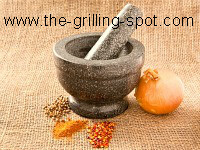 Use a chimney starter to make quick work of lighting if you are using a charcoal grill. Maintain the grill at medium temperature. In order to do this, space the coals further apart to achieve less heat. 5. 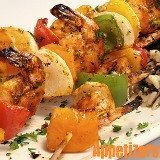 Get your skewers, cut vegetables and marinated meat. Start poking your skewer through a piece of meat as you alternate with other layers of vegetables. Watch your fingers, they are not part of the recipe! One piece of meat, then a slice of tomato, then a green pepper slice and lastly an onion slice. Keep alternating in this sequence until you have all your vegetables and meat all skewered and ready for the grill. If you are using wooden skewers, line the grid area under the exposed skewers with foil paper to protect the skewers from burning. 6. Grill the appetizer for 15-20 minutes until it is well cooked. Sprinkle some second-part peanut-spice sporadically to boost flavor as you grill. Use a probe or a food thermometer to check the meat temperature. The recommended internal food temperature for the grilling appetizers is 165 °F, in the middle of the thickest piece of meat. 7. Harvest the Suya or shish-kebabs from the grill and serve with the already saved one-part peanut-spice mix, sliced onions or any other favored dip, sauce, salad or side item. 8. Carefully chew your food and.....no..... just playing. Here is an additional Video resource for your convenience. You will see the basic Suya preparation, don't worry about using it in the Pizza. The skewered meat can be broiled or baked in an oven indoors either by choice, in the event of inclement weather or in extreme winter. Other options you can exhaust for the shish-kebab vegetables include zucchini, mushrooms, believe it or not broccoli, squash, orange and red peppers. 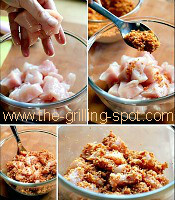 The first time you try this grilling appetizer recipe, you may have an excess of one or more of your ingredients. As you prepare and savor this recipe more regularly, you will get a better grip of quantities and ratios of spices to meat and vegetables to be able to temper the spice 'heat' to taste. Hopefully, you enjoyed this one-of-a-kind African Suya grilling appetizer recipe. It was customized to suit your preferences. Please come back for more!